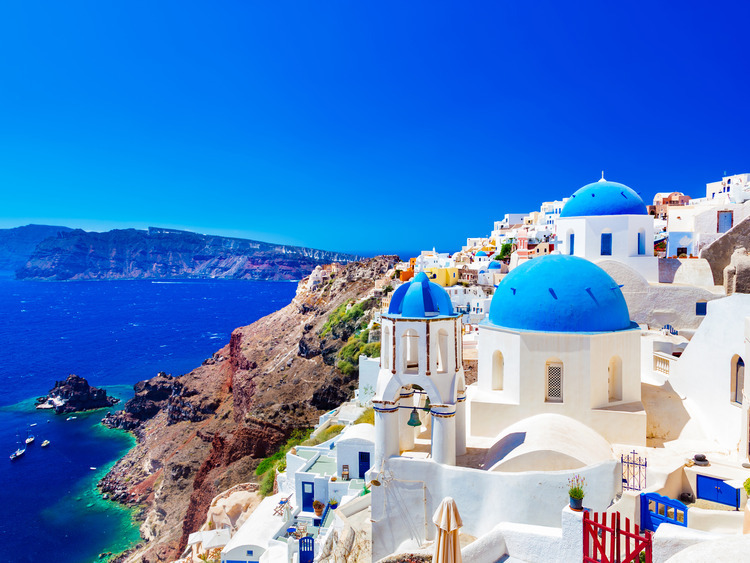 An unforgettable visit savouring the aromas and laid-back atmosphere of Oia village﻿: lose yourself in the maze of narrow streets, marvel at the dazzling brightness of the buildings and explore shops that seem untouched by time. A unique excursion, in which reality surpasses the imagination. A motorised boat will take us to the port of Athinios, where we board a coach and head for the north end of the island and the charming town of Oia. Along the way, we are treated to the stirring scenery of the volcanic caldera, the wide crater that is, today, mostly covered by the sea and surrounded by the high reefs of Santorini. In Oia, we venture into the wonderful marble-paved alleyways that wind their way up and down the hillside flanked by the ochre walls and blue domed roofs so typical of the island’s houses. Adding to our amazement, the town offers unrivalled views of the nearby islands of Folegandros and Sikinos, and the now-extinct volcano. With the splendour of the scenery fresh in our minds, we make our way back to the port of Athinios to board the launch boat back to the ship. Places on this excursion are limited. So please reserve early. This tour is not recommended for guests with limited mobility.